Professional Chef Testimonial: Why EDGES Custom Cutlery Is Superior – Design Your Lifestyle. March 2016 March 2016 Peter Salerno, Inc.
EDGES, the custom cutlery collection, is available exclusively from Peter Salerno Inc. Using the highest quality materials and a proprietary “hand-ground, hand-crafted” process, each piece of EDGES custom cutlery is a one-of-a-kind work of art. The founder and creator of EDGES, Anthony Michael Salerno, designed the series of custom knives and cutlery with three objectives in mind: performance, handling, and aesthetic beauty. The ergonomics of each piece are monitored with pinpoint accuracy in mind, and early reviews of the EDGES collection rave about the “perfect balance” between handle and blade. We could tell you so much about why we love this cutlery collection. But it’s far more important for you to know what professional chefs have to say about actually using the knives in the EDGES collection. 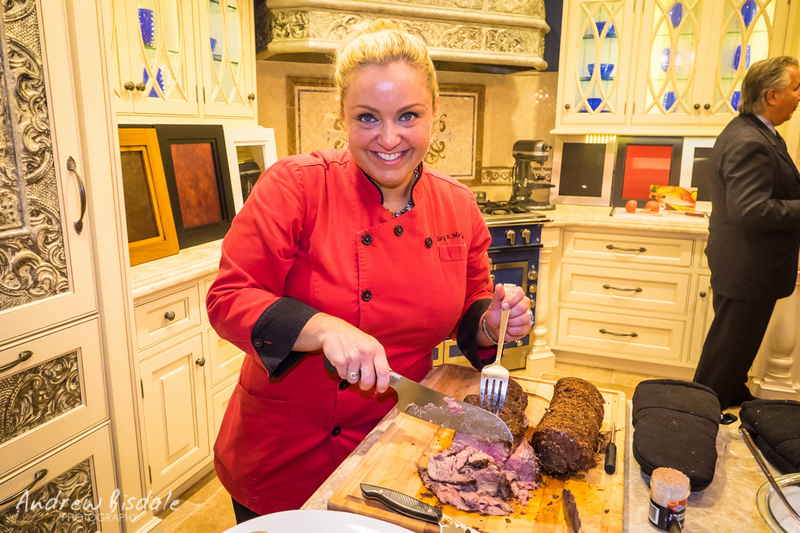 Mary A. Moulds is a Culinary Events Manager for Miele USA. Based out of their Princeton, NJ, showroom, Mary is a highly-qualified professional with a great deal of responsibility (and work) on her shoulders. The knives she uses in a professional setting must be balanced, reliable, and perform to the highest of standards. When Mary Moulds had the opportunity to handle and work with the EDGES collection, she was instantly impressed by the quality and effectiveness of the various designs in the initial fleet of custom cutlery. We asked Mary for a testimonial about her EDGES experience, and this is what she had to say. “On November 4, 2015, I had the absolute pleasure of working with the team from Peter Salerno, Inc. as they unveiled their new Miele Transitional Kitchen Display. This was an evening where some of the industry’s finest came out in support of this modern day kitchen & design firm to see what Peter’s team had been working so diligently on. While cooking has always been my passion and I have an opportunity to do this job I love every day, it is also a great chance for me to work in someone else’s kitchen once in a while as I get to experience new and unique opportunities. If you’re interested in the fine line of EDGES custom cutlery, please contact Peter Salerno Inc. at (201) 251-6608 for more details. Pingback: Celebrate National Parents’ Day With Us July 23rd – Design Your Lifestyle. Pingback: Design Your Lifestyle Turns 5: A Look Back! – Design Your Lifestyle.